Yo. Check it out, evidenced-based supplementation advice....no broscience degree needed. J Exerc Nutrition Biochem. 2016 Dec 31;20(4):1-12. doi: 10.20463/jenb.2016.0031. Timing, Optimal Dose and Intake Duration of Dietary Supplements with Evidence-Based Use in Sports Nutrition. Naderi A1, de Oliveira EP2, Ziegenfuss TN3, Willems MT4. The aim of the present narrative review was to consider the evidence on the timing, optimal dose and intake duration of the main dietary supplements β-alanine, nitrate, caffeine, creatine, sodium bicarbonate, carbohydrate and protein. 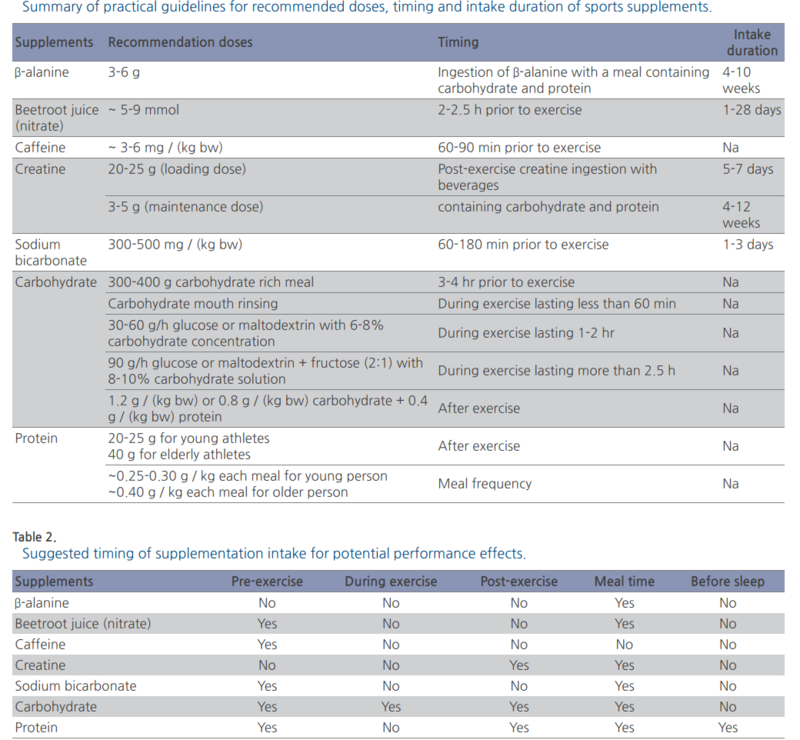 This review article will focuses on timing, optimal dose and intake duration of main dietary supplements for consuming. This paper reviewed the evidence to determine the optimal time, efficacy doses and intake duration for sports supplements verified by scientific evidence that report a performance enhancing effect in both situation of laboratory and training settings. Consumption of the supplements are usually suggested into 5 specific times such as, pre-exercise (nitrate, caffeine, sodium bicarbonate, carbohydrate and protein), during exercise (carbohydrate), post-exercise (creatine, carbohydrate, protein), meal time (β-alanine, creatine, sodium bicarbonate, nitrate, carbohydrate and protein), and before sleep (protein). In addition, the recommended dosing protocol for the supplements such as, nitrate and β-alanine are fixed amount of irrespective of body weight, while dosing protocol for sodium bicarbonate, caffeine and creatine supplements are related with corrected body weight (mg/kg bw). Also, intake duration of the supplements is suggested for the supplements such as, creatine and β-alanine are effective in chronic daily time < 2 weeks while caffeine, sodium bicarbonate and are effective in acute daily time (1-3 hours). Plus, ingestion of nitrate supplement is required in both chronic daily time < 28 days and acute daily time (2-2.5 h) prior exercise. Am J Physiol Endocrinol Metab. 2017 Apr 1;312(4):E282-E299. doi: 10.1152/ajpendo.00230.2016. Epub 2017 Jan 31. "Nutraceuticals" in relation to human skeletal muscle and exercise. Deane CS1,2,3, Wilkinson DJ1, Phillips BE1, Smith K1, Etheridge T3, Atherton PJ4. Skeletal muscles have a fundamental role in locomotion and whole body metabolism, with muscle mass and quality being linked to improved health and even lifespan. Optimizing nutrition in combination with exercise is considered an established, effective ergogenic practice for athletic performance. Importantly, exercise and nutritional approaches also remain arguably the most effective countermeasure for muscle dysfunction associated with aging and numerous clinical conditions, e.g., cancer cachexia, COPD, and organ failure, via engendering favorable adaptations such as increased muscle mass and oxidative capacity. Therefore, it is important to consider the effects of established and novel effectors of muscle mass, function, and metabolism in relation to nutrition and exercise. To address this gap, in this review, we detail existing evidence surrounding the efficacy of a nonexhaustive list of macronutrient, micronutrient, and "nutraceutical" compounds alone and in combination with exercise in relation to skeletal muscle mass, metabolism (protein and fuel), and exercise performance (i.e., strength and endurance capacity). It has long been established that macronutrients have specific roles and impact upon protein metabolism and exercise performance, (i.e., protein positively influences muscle mass and protein metabolism), whereas carbohydrate and fat intakes can influence fuel metabolism and exercise performance. Regarding novel nutraceuticals, we show that the following ones in particular may have effects in relation to 1) muscle mass/protein metabolism: leucine, hydroxyl β-methylbutyrate, creatine, vitamin-D, ursolic acid, and phosphatidic acid; and 2) exercise performance: (i.e., strength or endurance capacity): hydroxyl β-methylbutyrate, carnitine, creatine, nitrates, and β-alanine. Do BCAA's offer any advantage over complete protein post workout? Not sure if it was here somewhere, but I recall reading that BCAAs offer no advantage over PRO. Now, if you're trying to not consume a caloric supplement, there might be some advantage, yes? Yes. I could certainly see how if you were watching your caloric intake, going with BCAA over complete PRO would make sense. BCAA works well for fasting, or IF when you work out in the morning but don't eat until noonish. Whoah. Would really like to read all of that when I get time. It cited 274 studies lol. I can only imagine how long it took to write that. You can fit way more servings of BCAA's in your gym bag. I can't imagine a few scoops difference being a good reason. What is carbohydrate mouth rinsing?